A couple of weekends ago I was very luckily invited to the Bloggers Festival by the lovely Scarlett London which I was super excited about as I couldn't make the last one! The event was held at the gorgeous Conrad Hotel at St James Park which was just beautiful, the event was held downstairs so we descended down the intricate swirled staircase and were greeted with a glass of champagne upon registering. I've been to a few events before but nothing on this scale! The room where it was held was full to the brim with brands and gorgeous bloggers alike. I made my way around the room speaking to the lovely ladies from all kinds of brands (too many to list) and picked up some lovely samples to try along the way. Seriously it was a busy ram packed event and I loved every second of it, plus I got to meet so many new bloggers which was obviously the best part! And heres what I wore! As the Bloggers Festival was a special occasion I wanted to look my best so that meant I spent the week before frantically trying to find something decent to wear. You know how it is, you look in your wardrobe and see the same old same old clothes staring back at you so I wanted something new. 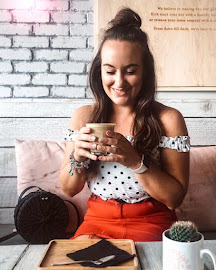 If you've read my blog for a while, you will know that I struggle to buy tops, I can find pants, skirts or anything else but I don't know what it is about tops I just really struggle. On a recent last minute shopping spree I searched the shops of Liverpool and literally was on my last legs but as I wandered into Zara this little number caught my eye. It's unlike anything I have in my wardrobe, it's low cut, lacy and pirate-like but I absolutely love it. It was exactly what I was after and as soon as I bought it the rest of the look just kind of came together. Did you go to the Bloggers Festival? What do you think of this look?